When the great jazz composer and pianist Dave Brubeck died on Dec. 5, 2012, a day short of his 92nd birthday, some members of the Class of 1957 reminisced about their having sponsored a concert by the Brubeck quartet in Little Bridges 58 years earlier. 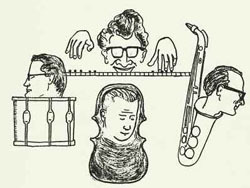 This was mainly the doing of our classmate Marvin Nathan, who was a big fan of Brubeck and had gotten to know the members of the quartet the summer after our freshman year, in 1954, when the musicians had a three-month gig at Zardi’s in Hollywood. Nathan went to the club nightly during the vacation and returned to college full of enthusiasm for the new style of jazz played by Brubeck. Marvin recounts: “That Christmas I gave the four of them their first matching set of ties, handkerchiefs and cuff links, which, I think, they wore at the Pomona concert.” He made the arrangements directly with Brubeck, and a committee of the Class of ’57 was formed to produce the concert. Brubeck was the first to play college dates, lifting jazz out of smoke-filled clubs. Those were simpler times: no agent or manager or record company was intermediary. We just asked Brubeck, and later, for another concert sponsored by the class, Andre Previn; they said yes, turned up with their sidemen and played and got paid. But paying the musicians required a paying audience. Steve Glass ’57 and subsequently professor of classics at Pitzer College, recalls that early ticket sales for the Brubeck concert were going slowly. His classmate and future wife Sandy was in charge of publicity and she was worried. In those days, West Coast/Cool Jazz was a relatively arcane phenomenon. 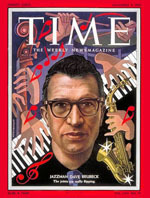 Then, shortly before the concert, the Nov. 8, 1954 issue of Time magazine had Dave Brubeck on the cover, only the second jazz musician to be so featured (after Louis Armstrong), and the place was packed. Marvin left Pomona after two years to study jazz saxophone at the San Francisco Conservatory of Music but decided the instrument should be left to the likes of John Coltrane and instead became a humanities professor. All of us amateur promoters remained jazz aficionados. Why, just this morning I refolded my fedora into a pork-pie hat and set off looking the hepcat I wished to be.